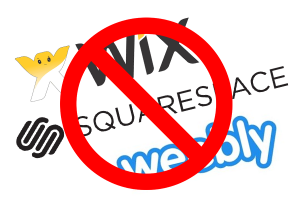 Why You Should Nix Wix…and the others, too. On the surface, we get it. A free website and an easy-to-use interface that allows you to build your own website in about an hour. What’s not to like, right? Of course, it’s not all bad. There are reasons why someone might want to use a free site-builder website. But there are tradeoffs to the “free” part. Here are some pros and (mostly) cons that you should consider if you’re on the fence. While sites like Wix, Squarespace, and Weebly offer many modern templates to choose from, if your creative vision goes beyond what they offer, or if you seek a certain feel or function from your site, you are limited to operate within the confines of what they provide. Building a custom website on a platform like WordPress or Joomla provides you with scalability and almost limitless potential – in both design and function. Working with a trained web designer can not only help you through the creativity blocks, but also save you from endless hours of trying to “figure it out.” There are many pieces and parts to a website. True, it’s not all rocket science, but it may not be worth it for you to undergo the task of learning a whole new trade while you try to run your organization. The time saved and convenience added of working with a web professional may be worth the investment. Speaking of investment, what does it all boil down to? Is free really free? Well, sort of. For example, with Wix, their free website plan offers you a luxuriously custom domain name that no one, including probably yourself, will remember. Your fancy, no-cost URL will be something like: username.wixsite.com/sitename/page-url. Um, no thank you. *Pricing based on a close apples-to-apples comparison and is subject to change. 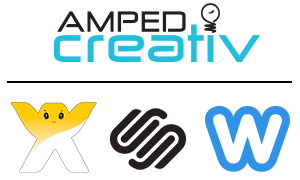 Comparatively speaking, AMPED creativ can design a business-level website for as low as $999. Considering that most websites last 3-4 years before they need any major redesign or upgrades, working with a web designer or creative firm can sometimes actually save you money in the long run. Whether or not Wix or Squarespace or Weebly or any other website-builder site is right for you, is a decision that only you can make. Sometimes they’re a right fit. Sometimes they’re not. The point of this article is not to bash any one of these companies. It’s to provide you with food for thought that hopefully helps you take the right first step toward building a website that works best for you and your organization. A seasoned web designer or local creative firm is generally only a phone call or stones-throw away. Having support close by will help you navigate all the questions, the challenges, the solutions, the possibilities, and all the things in between that are bound to pop up along the way. Ultimately, you don’t want to go it alone if you don’t have to – and most of the time, you shouldn’t! Want to talk about your idea for a website? Want to see what it will truly cost? Let’s start a conversation.